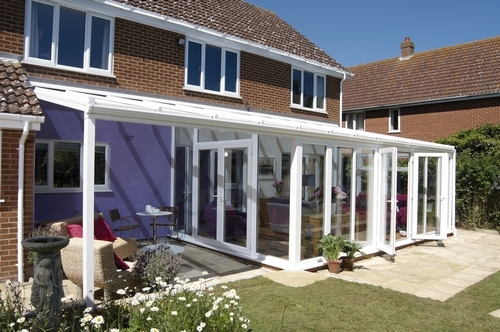 Anglian Home Improvements are proud to announce that our Conservatory Verandas are now available in our full colour range. This includes, Dark Woodgrain, Dual Anthracite Grey and Golden Oak, giving you more choice on the look of your conservatory and veranda, ensuring it will look stunning on a variety of different houses. Now, I am not an architect, but here is my opinion on what colours I think would look great on a different style of homes. White has become the most popular choice in recent years, looking great on pretty much any house out there, but I love this particular Conservatory veranda because of how great it looks on the house, and the way the owners have decorated the external wall underneath the veranda. I think they have added character, class and style to their back garden and I am sure they have had many a great evening under their veranda. 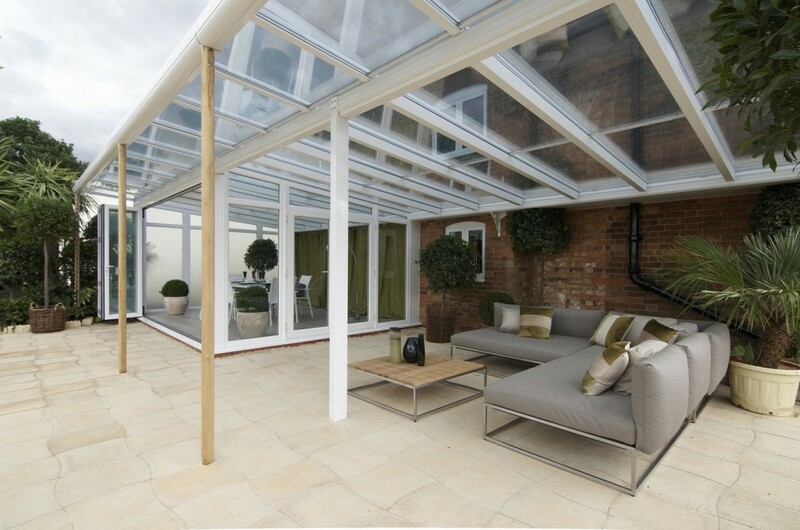 I personally love the design of the above conservatory veranda and I think that Golden Oak would look just as good as the white. This building is relatively old, and to match the feel of the home, I think the golden oak colouring would add to the rustic feel of this home, although modernising it at the same time. I also think it would compliment the paving effortlessly and with some wooden furniture and plain cushions, it could have a very traditional, cosy area to bask in the sun. Our brand new colour, Anthracite grey, is definitely a colour for the modern house. This colour would look fabulous on a newly built ecohome, showing off a great design in the unique grey colouring, boasting individuality to help you stand out from the rest of the neighbourhood. Finally, for those of you living in cottages or older homes, we share with you the Dark Woodgrain colouring. This ties in perfectly with the older style of home, adding to your homes already stunning aesthetics, whilst giving you extra space and a lovely room to enjoy your garden.